THE BOOK THAT STARTED IT ALL. NOW SOLD MORE THAN 200.000 COPIES. NEW RE-EDITED VERSION. Another spine-chilling Mystery Novel by Best-selling Author Willow Rose. Once you start One, Two ... He is coming for you - there is absolutely no turning back. Set in the Danish coastal town of Karrebaeksminde, journalist Rebekka Franck returns to her hometown with her six year old daughter. She is trying to escape her ex-husband and starting a new life for her and her daughter, when the small sleepy town experiences a murder. One of the kingdoms wealthiest men is brutally murdered in his summer residence in Karrebaeksminde. While Rebekka Franck and her punk photographer Sune try to cover the story for the local newspaper another murder happens on a high society rich man. Now Rebekka Franck realizes that the drowsy little kingdom of Denmark has gotten its first serial killer and soon a series of dark secrets - long buried but not forgotten - will see the day of light. One, Two ... 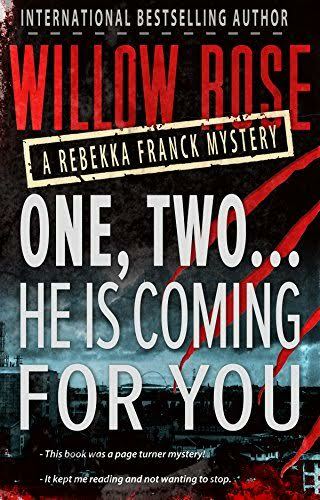 He is coming for you is the first book in Willow Rose's mystery-series about the reporter Rebekka Franck and her photographer Sune.